Beyond these things. That's what Procol Harum, the term, meant. The band too. 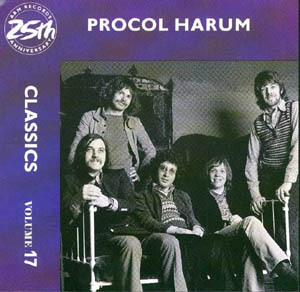 In an era when musicians were first beginning to choose strange group names simply to be different, Procol Harum chose their very different name simply to be accurate. They were beyond these things. They were not your typical British rock band, late sixties vintage. Instead, they were Bach in the Summer of Love. They were genuine soul, and equally genuine poetry. They were paisley and silk playing heartfelt Rhythm and Blues. They were gentlemen of the London street. They were playful and cerebral, intense and internal. They were graceful, powerful and fun. And very unique. The trigger for the creation of Procol Harum was the 1966 pairing of singer / pianist Gary Brooker and aspiring lyricist Keith Reid. Introduced to Reid by a mutual friend, the skilful Brooker was coming out of a stint with the Paramounts, an earnest R&B band whose local popularity once rivaled that of the Rolling Stones but whose records had never achieved that kind of magic. Reid, working an assortment of jobs, was writing lyrics which exhibited a skewered sense of street smarts alongside a deft sense of the literary. Together, Brooker and Reid worked their diverse influences and inspirations into a stately, yet propulsive new approach. As songs took shape, the pair went looking for people to help play them. Among the first they recruited were the knowledgeable organist Matthew Fisher and bassist David Knights. Later, drummer Barrie (BJ) Wilson and guitarist Robin Trower (another former Paramount) would also add their sounds full-time to the initial Procol Harum vision. This sextet constituted the band that wrote and recorded the three foundational Procol LPs, Procol Harum, Shine On Brightly and A Salty Dog. Subsequently, Fisher and Knights would leave, replaced by Chris Copping and, eventually, Alan Cartwright. Trower would depart to guitar hero status, replaced first by David Ball and then by Mick Grabham. Other Procol participants would include Ray Royer (guitar), John [sic – Bill] Eyden (drums), Bobby Harrison (drums), Dee Murray (bass) and Pete Solley (keyboards). Procol's collective genius stemmed from the unique strengths of their key members. Brooker was arguably one of Britain's best white R&B vocalists as well as a versatile pianist and arranger. Trower proved a distinctive, searing electric guitarist with a facility for blues and a taste for pyrotechnics. Wilson was a percussionist who could seemingly play in several rhythmic streams at once. Fisher was a classicist who early on divined the elusive place where Bach fugues and rock and roll could not only co-exist, but truly thrive. Then there was Reid, a well-spoken, well-read world traveler with a love for gut-bucket R&B. His words articulated ideas no pop lyricist had attempted, from perspectives others hadn't yet imagined. His first masterpiece was the wry description of a wild party in Chaucerian terms, A Whiter Shade Of Pale. It was sung by Brooker in a manner not unlike that of American soul singer Percy Sledge, over organ lines Fisher adapted directly from Bach. It went to number 1 around the world. Keith proceeded to write about garden fences, multi-lingual business friends, dreamers and their dreams, sea captains, schizophrenia, boredom, politicians and their followers, drunkards, journalists, and countless other people and ideas, all with an acuity, elegance and perceptiveness unmatched in pop annals. His words were nicely matched by the varied music of Brooker and company on a series of acclaimed and popular albums over the course of a decade. Perhaps the singly most popular of these albums was Live With The Edmonton Symphony, on which an always excellent performing band wedded its most symphonic pieces to the sound of a full orchestra playing arrangements by Brooker. It was an inspired combination, yielding a major hit single in Conquistador, so memorable with its martial melody and historical commentary. Procol were a band for whom the sound of things was extremely important. Consequently, the precise reproduction of compact digital discs is an ideal vehicle for their work; a band that always sounded great has never sounded better. There's the visceral power of Simple Sister and Whisky Train, with their stunning Robin Trower guitar explosions set against BJ's rippling thunder, Shine On Brightly, featuring one of the most perfectly conceived organ solos on the planet, and Repent Walpurgis, timeless in its emotional application of intense instrumental passages. This is music which speaks to a different part of us, from a different place entirely. It has never spoken more clearly than in this format. At one of the band's many memorable concerts, Gary Brooker introduced A Salty Dog by acknowledging that advisors had lobbied against its being released as a single. In light of its unusual subject matter and non-commercial structure, he explained, 'they said we were wrong about the song. But,' he cooly added, 'we were right.' A Salty Dog was never a hit, yet it is the classic piece of music Brooker implied that night. The group, plenty popular but never really rock and roll stars, enjoy a similar retrospective status. This collection is but a sampling of their distinctive brilliance. Like few others, Procol Harum succeeded in harmoniously bringing together some of our musical culture's most disparate elements. They were indeed right about their music, and they long ago earned this chance to be remembered with both distinction and permanence.